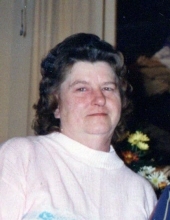 Rachel Jane Wilson, age 71, of Union Bridge, died suddenly Saturday, January 26, 2019 at her home. Born March 30, 1947 in Frederick, she was the daughter of the late Albert and Pearl Brice Misner. She was the wife of Roy Alvin “Pete” Wilson, who predeceased her in 2009. Mrs. Wilson was formerly employed as a seamstress. She enjoyed playing bingo and spending time with her grandchildren. Surviving are a daughter, Tammy S. Capece and husband Brad of Taneytown; grandchildren, Casey and Carmella Capece; and brother, David Misner of Thurmont. She was predeceased by her son, Kenneth Elwood “Repete” Wilson; and four siblings. The family will receive friends at Hartzler Funeral Home, 6 E. Broadway, Union Bridge, on Thursday, January 31 at 4 p.m. A funeral service will be held at the funeral home following the visitation at 6 p.m. Rev. Jade Rogers, pastor of Keymar Evangelical Wesleyan Church, will officiate. Inurnment will be at a late date in Union Cemetery, Keysville. To send flowers or a remembrance gift to the family of Rachel Jane Wilson, please visit our Tribute Store. "Email Address" would like to share the life celebration of Rachel Jane Wilson. Click on the "link" to go to share a favorite memory or leave a condolence message for the family.